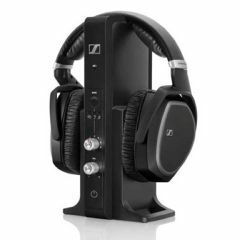 AllegroMedical.com presents The Sennheiser RS 195 Wireless RF TV Listening System. For unparalleled sound quality, ease of use and comfort, the RS 195 is your personal hearing and ultimate audio companion. Whether you are watching TV or listening to music, the RS 195 ensures you won't miss a thing: highly innovative digital wireless technology guarantees crystal clear sign transmission even when you move from room to room. The various listening modes allow you to adapt the sound according to your individual needs and preferences. The RS 195 lets you hear the subtle nuances of TV dialogue and the slight details of your favorite song like never before. Convenient controls on the wireless headphone receiver makes it easy to take advantage of the RS 195's many features, and the ergonomic design provides a comfortable fit, even after hours of wear.